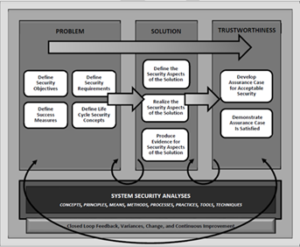 To apply this framework to the SCOTT project, the focus was widened to address not only security based trust issues but also address user-related trust issues that include contextual, organizational, and indivudal user factors as well as system dependability and privacy. Trust has been extensively researched in the last years in the areas of human factors, psychology, and management and significantly informs the wider approach that is here taken. Multiple trust definitions generally converge on viewing trust as a positive user attitude about engaging voluntarily in an interaction with the acceptance of a certain vulnerability. Various models of trust have been developed that point to the multifaceted aspects of trust formation that include beside technological factors also psychological, social, and organizational contextual factors. Also the individual experiences that users have made are generally recognized as important. With participation of relevant social science experts, SCOTT will incorporate these social science and human factors aspects of trust into the SCOTT trust development framework. 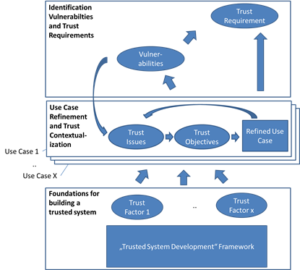 That SCOTT framework will enable trust managers within each use case team to derive the specific contextualized trust issues, trust objectives, and trust requirements that allow achieving an overall trusted solution while also allowing generalization from the SCOTT project to build trustable systems, see figure below. The selected SCOTT use cases cover the prevalent trust factors that are expected to contribute to the formation of system trust. Whereas considerable guidance for building trusted systems exists in the discipline of system engineering, most have focused on various aspects of system security. For example, the U.S. National Institute of Standards and Technology has developed a specific framework for building trusted systems which is planned as an extension to ISO International Standard ISO/IEC/IEEE 15288: Systems and software engineering — System life cycle processes, see figure below.